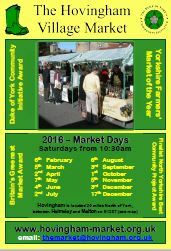 The Hovingham Village Market has been running since October 2009, although the first Market in Hovingham predates this and was opened around 1256. Hovingham is located about 18 miles north-east of York, 8 miles between the market towns of Malton and Helmsley on the B1257. The Hovingham Village Market is run by village volunteers to provide a monthly market for this and the neighbouring area. It is run on the first Saturday of each month, from February to December, and an additional special Christmas Market on the third Saturday of December. The Market Group are very grateful for the support of shoppers and users of the unique Community Café, together with all the stallholders, both regular and occasional guests. Sincere thanks to the over 100 volunteers who staff the Cafés, help setup and take down the stalls, give up their spare time to help visitors, hand out literature and sell shopping bags. The Market benefits our local community, together with local businesses providing local produce and crafts. We look forward to welcoming you to the Hovingham Village Market.